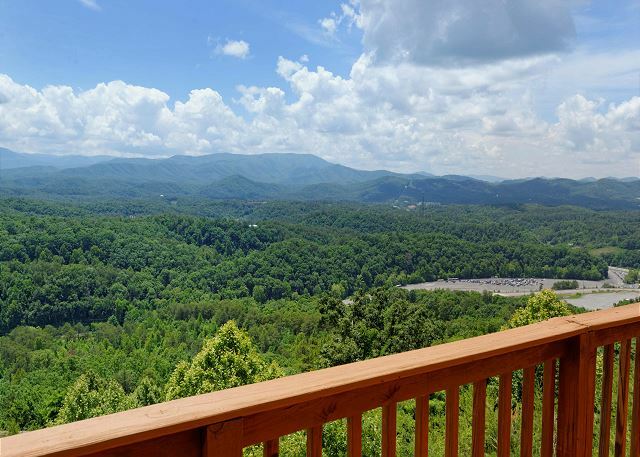 Morning View is a beautiful two story, one bedroom log cabin with a spectacular view of the Great Smoky Mountains and is close to Dollywood,... VIEW NOW. 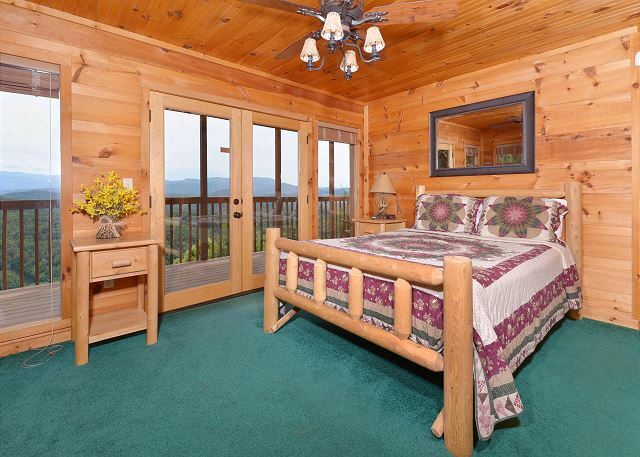 The "Amazing View #223" cabin is a two bedroom, two bath log luxury vacation rental with a bonus Full Bed kids' room. 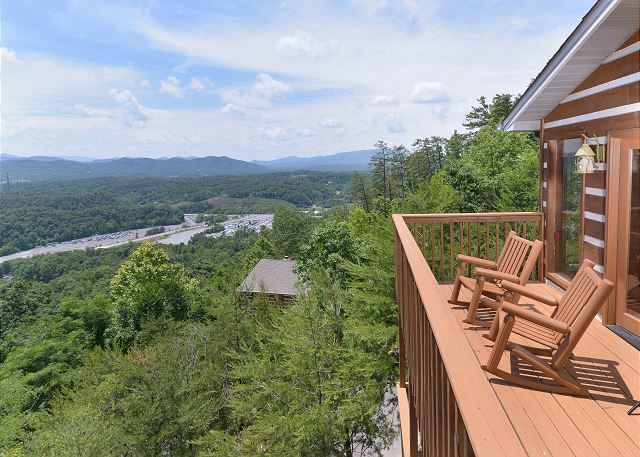 It sits atop an amazing mountain ridge overlooking parts of Dollywood, facing a spectacular mountain view! 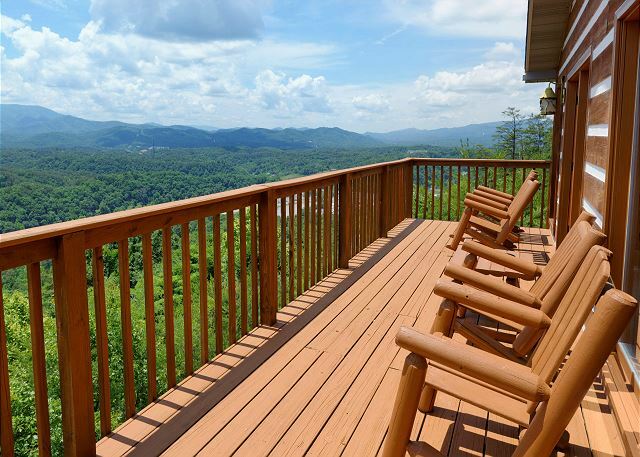 During the Summer, watch the Dollywood fireworks from your back deck! 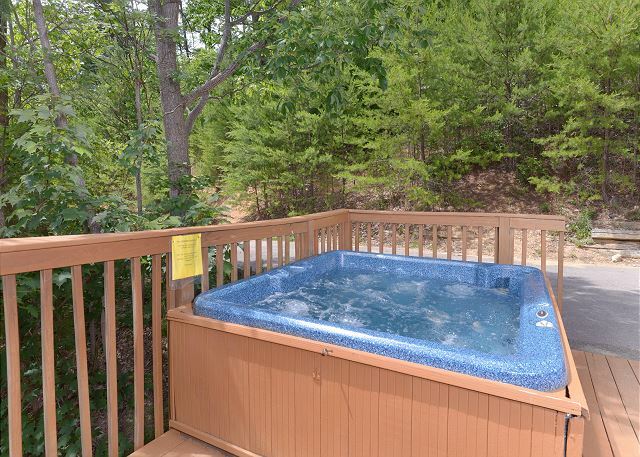 Enjoy the views from your rockers on the deck or relax in your own private hot tub. 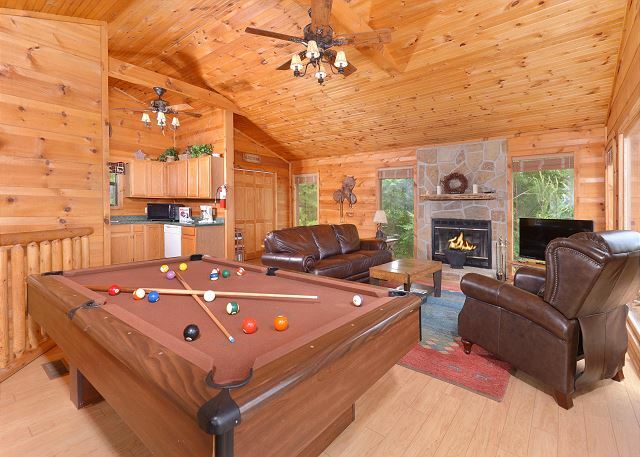 There is a pool table for entertainment and an indoor Jacuzzi tub for your relaxation. 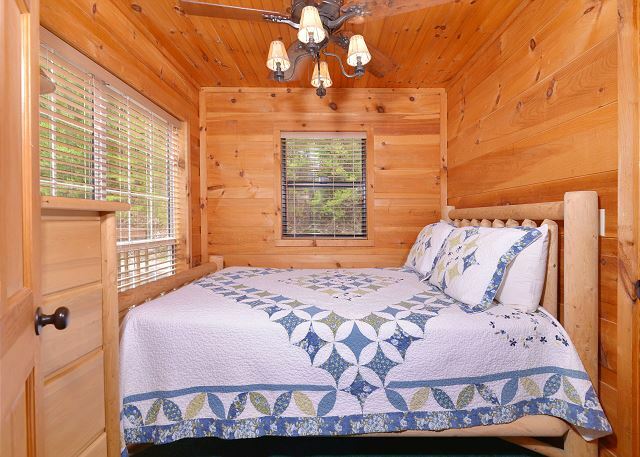 Close to Dollywood and all the attractions, this beautiful cabin will comfortably sleep up to eight with a king bed, 2 queen beds and a sofa sleeper in the living area. Wi-Fi internet is also available for your convenience. 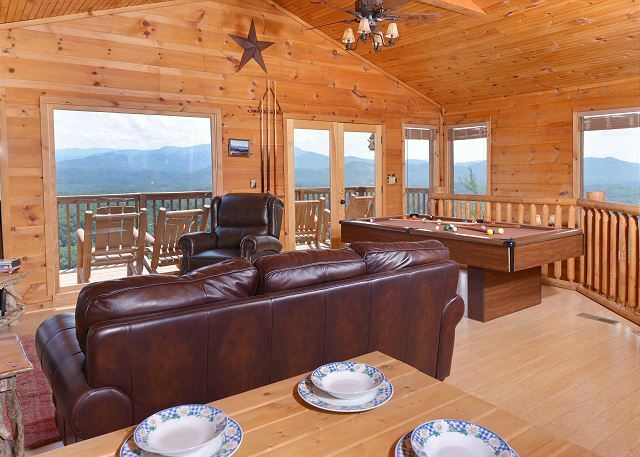 Come stay in Amazing View and have an amazing vacation with family or friends! 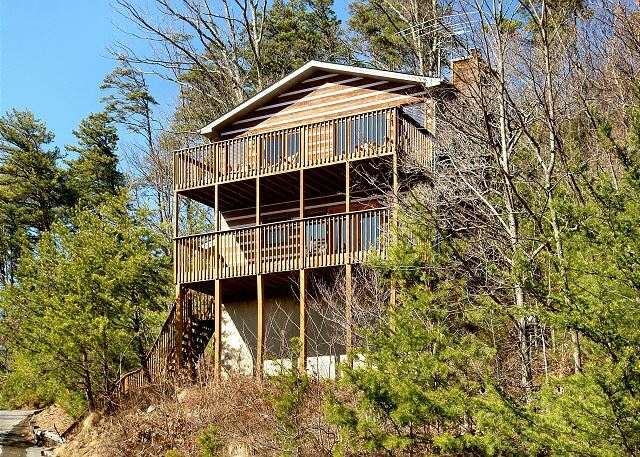 This amazing cabin has a secluded location above Dollywood. The incline drive warrants our recommendation to have a 4 wheel drive vehicle (SUV or Truck preferably) during the Winter Season, with caution throughout the year because of steep and narrow roads. The final result is a fabulous view, but the disclosure of steep roadways for travel is warranted. There is parking for only 2 vehicles. 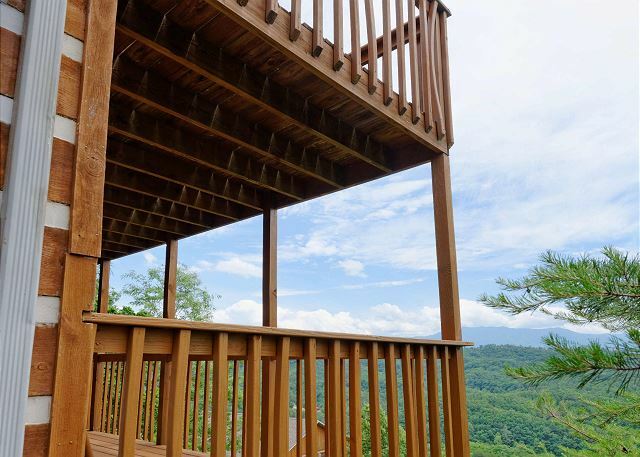 This cabin has a steep access road to get to the heights it demands for one of the top views in all of Pigeon Forge! 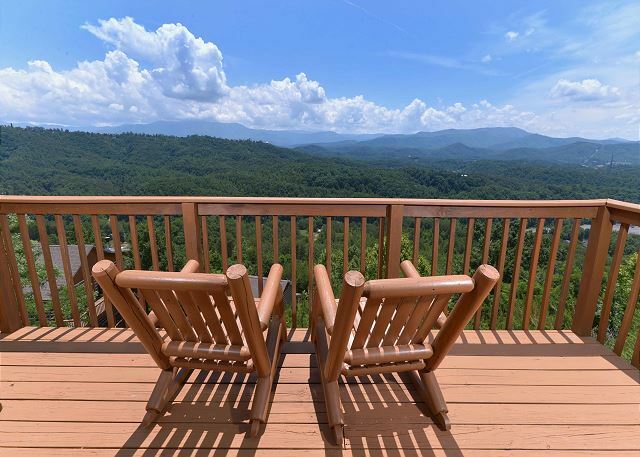 If you are looking for the Best View in Pigeon Forge, this one is definitely at the TOP of the List! 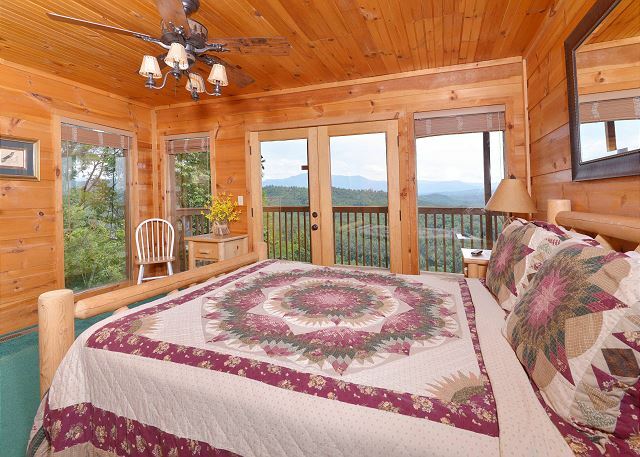 Come stay at Amazing View #223 for the Vacation of your Dreams with Aunt Bugs & Acorn Cabin Rentals! From June 11th and August 8th, witness the daily beautiful Dollywood’s fireworks! 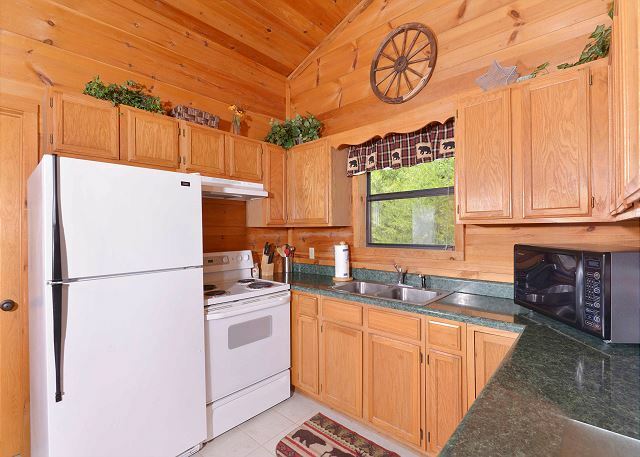 Loved the cabin! Kitchen well stocked with tools. Loved having games and videos. Only issue was toilets overflow easily. We had a GREAT stay at Amazing View. Just as the reviews said I am glad I had a 4 wheel drive because it is scary getting up there. Once on top it is ABSOLUTELY BEAUTIFUL !!! The dogs had a great time too!!! When they say amazing view,so true. 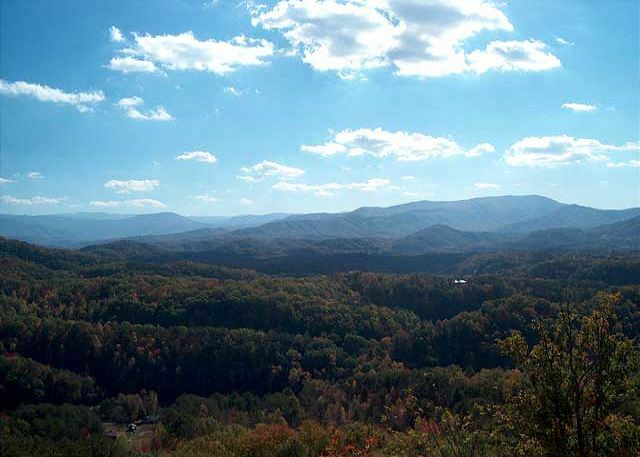 I have spent six Christmas in the area, of Gatlinburg and piegeon forge. The view was the best. You do not want to drive a large vehicle. The drive way is very narrow. I do suggest a four wheel drive, incase of bad had all of the kitchen supplies. I didn't get the insurance, but after I saw the drive.Its best to get it. We brought plenty of food and water just in case of bad weather. 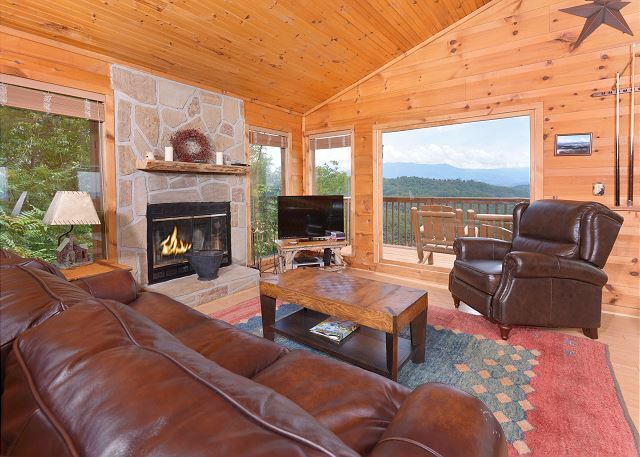 Great visit, beautiful cabin and view. Loved the fireworks at night. 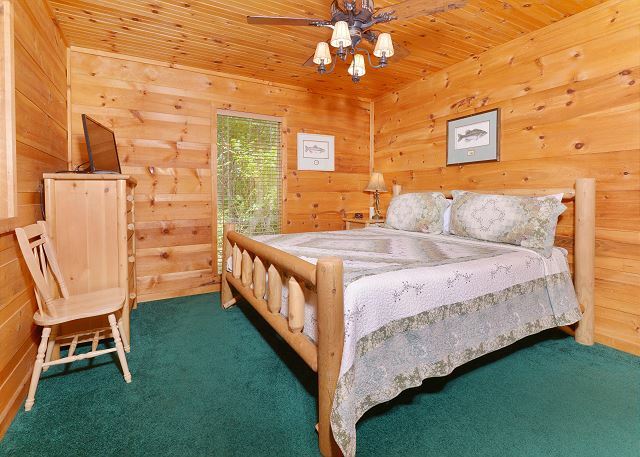 Only critique was that it was not immediately obvious that it was a one-way street to and through the cabins. I went down the wrong way a couple of times before I saw the sign. I initially thought the path around the cabin at the top of the hill (just past amazing view climb) was a parking area dead end. 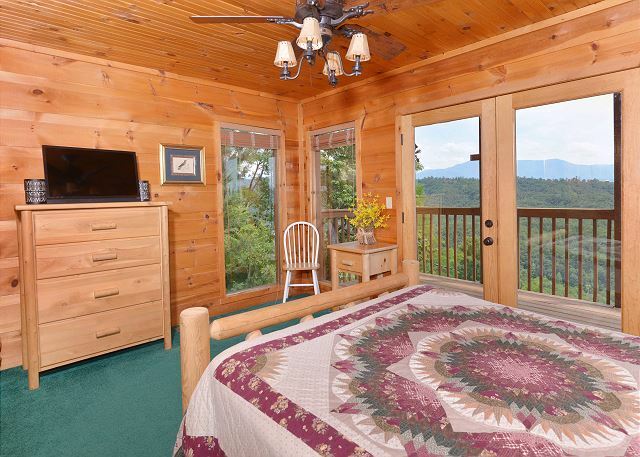 The view in this cabin was spectacular. All items on the list of expectations were met and then some. 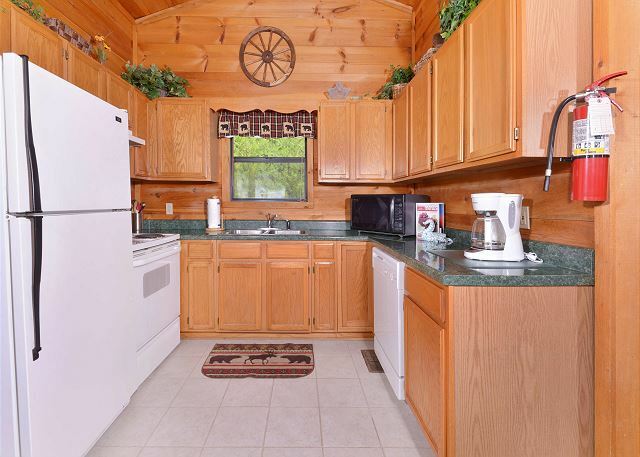 I was a little concerned about the drive to the cabin after reading the reviews, but with a little maneuvering it wasn’t that bad. 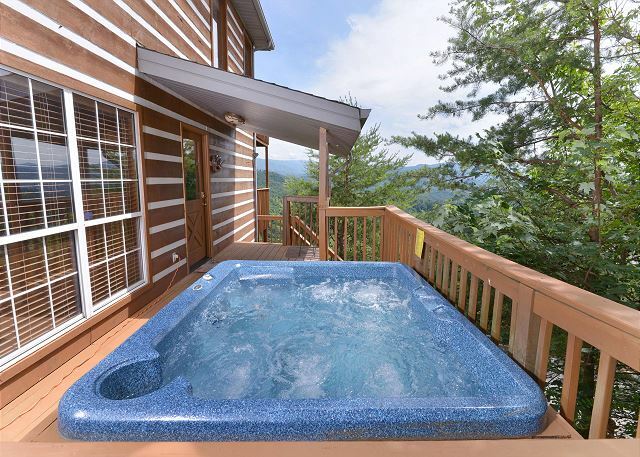 The only critique I could possibly have was that the hottub could use a thorough cleaning as it was a bit gritty. Aside from that, I was extremely satisfied with my stay and will definitely be back. 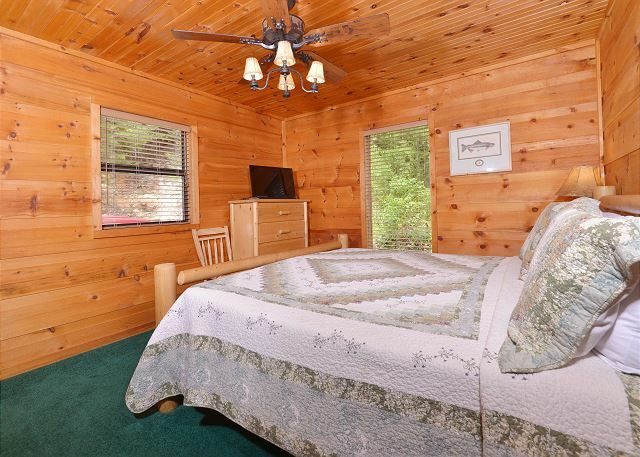 Nice cabin, beautiful view, nicely decorated! 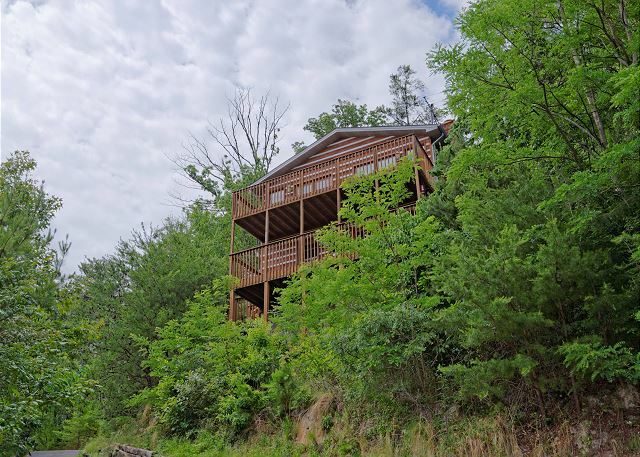 The drive up is very steep and our vehicle couldn't make the sharp turns, but there was a parking spot down below that we used and then we walked up to the cabin. It was a little inconvenient, but nothing too bad. Each night we had a perfect view of the fireworks from Dollywood! 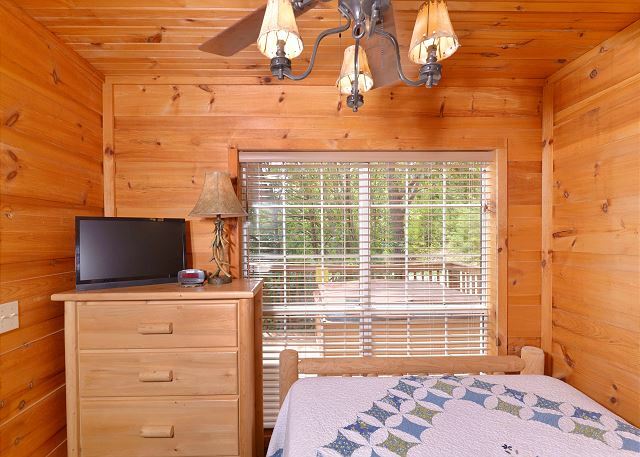 We were also close to Pigeon Forge and all of the attractions and restaurants so the location was excellent. 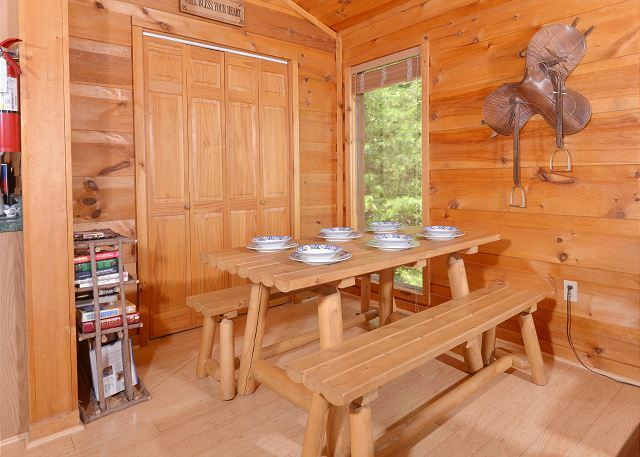 The cabin was great. Location was perfect for us since we wanted to be secluded. The drive was a bit nerve racking but worth it. 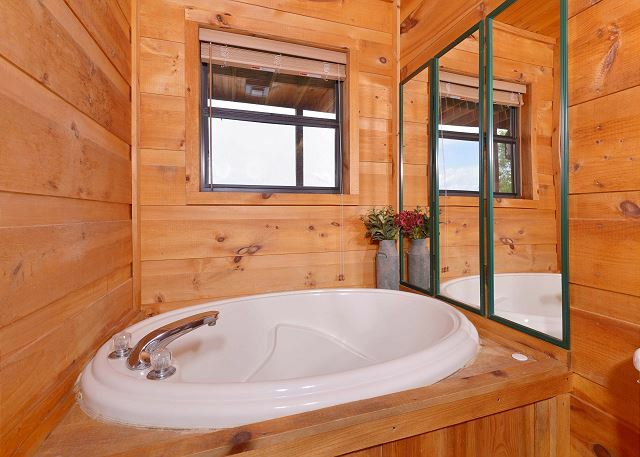 My only complaint was I wanted to get in Jacuzzi but the water wouldn't stay hot long enough to fill it up. It was a bit disappointing.thank god for the hot tub. Other than that I couldn't ask for a better weekend getaway. Not to mention the view was amazing!!! Our family of 5 stayed at Amazing View for seven nights. 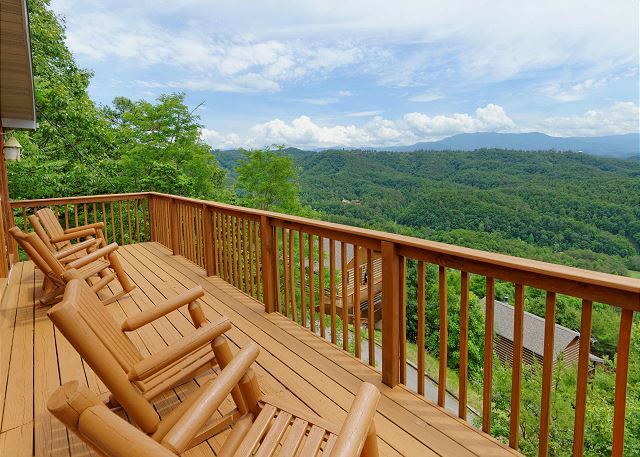 We had plenty of room and really enjoyed the view of the mountains from our deck. It was nice to have a washer and dryer, dishwasher, and plenty of ice in the freezer. There were three nice size bedrooms on the lower deck but the beds were quite firm and the pillows were very thin. 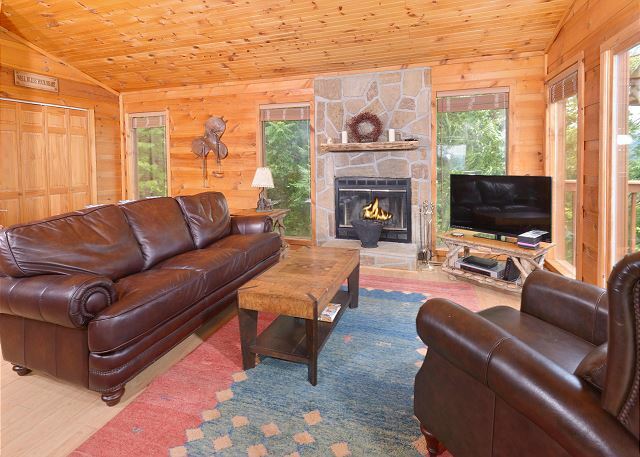 The upper floor had very nice living room furniture and a dvd player that we used to watch movies. There were a few minor things like lightbulbs being burned out but overall we had a very enjoyable stay. The drive up the hill was not as bad as we anticipated, but it is one way in parts so you need to read the road signs. 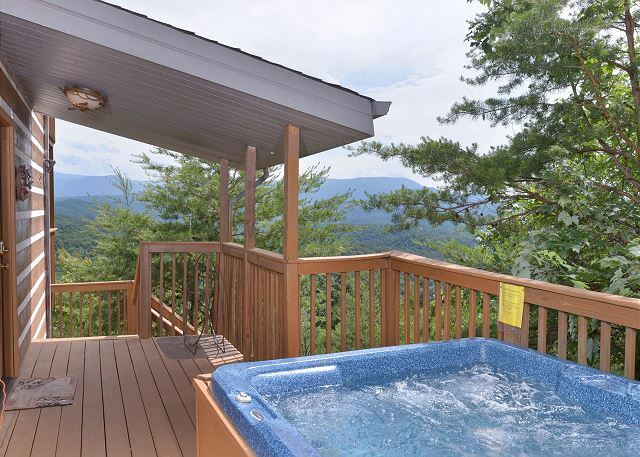 We wished the hot tub would have been on the deck with the view instead of being at the entrance to the house. The hot tub needed some maintenance. 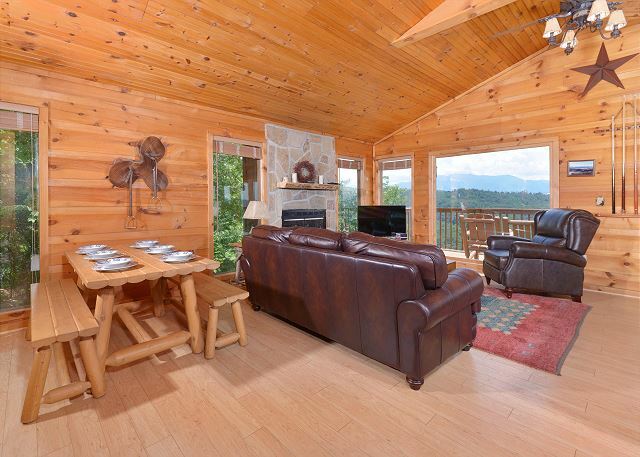 We have a wonderful time, the people from Aunt Bugs were very helpful and friendly making our stay very easy, we will comeback again, great view of the mountains ,all clean and enjoyable. 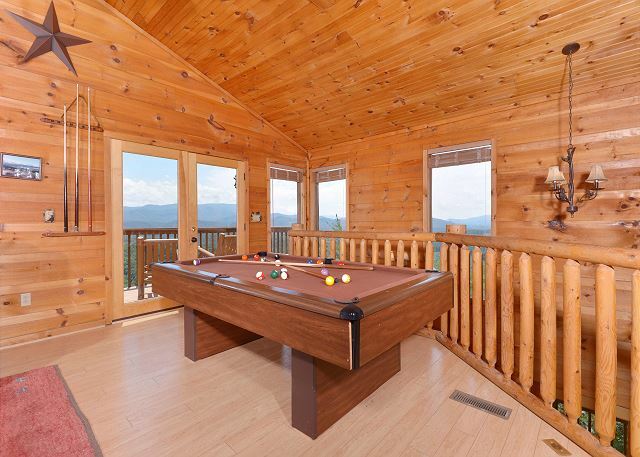 The best thing about the cabin was the fabulous view. It didn't disappoint. Love watching fire works from Dolly Wood every night. Didn't like road to cabin. Hard to make turns. We spent all day out and about doing things with the kids!! 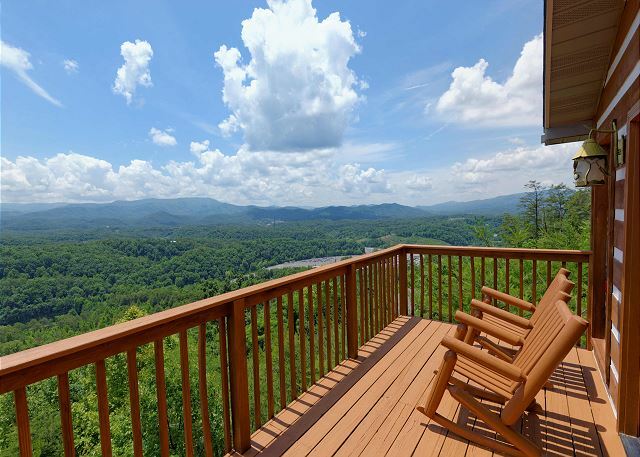 We truly love the Gatlinburg area. The cabin we stayed in was a little difficult to get to due to sharp switchbacks but we made the best of it. The hot tub was a little outdated and felt like it needed to be cleaned. 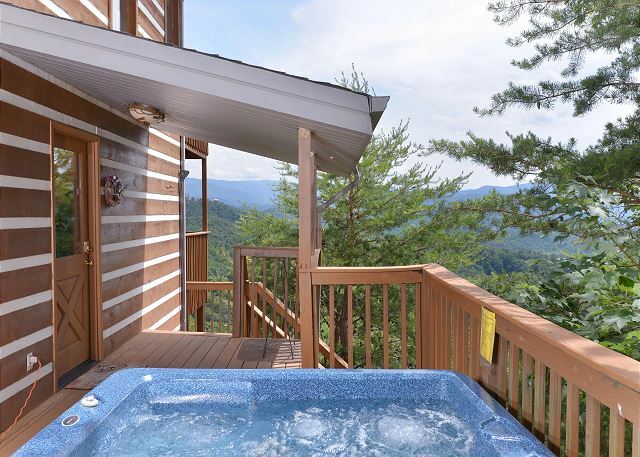 Other than that the place, location, view, and gatlinburg were awesome!!! I want to return for a vacation sometime soon! Fantastic cabin had a blast. That being said I dont believe enough has been said about the drive from the bottom of the mountain to the cabin. These hairpin turns are very difficult --they are on a very steep grade and you cannot negotiate the turns without stopping and backing up even in a small suv. If you are driving something with a long wheel base or a manual transmission you better have nerves of steel as there are no guard rails. 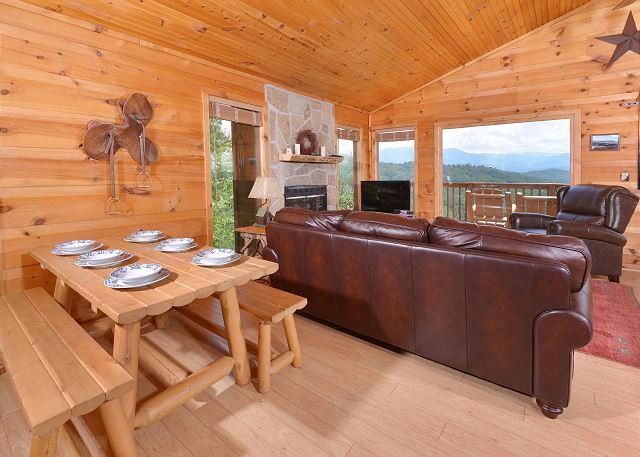 The cabin was incredible though and the view lived up to its name!